Project: Re-design of existing site. 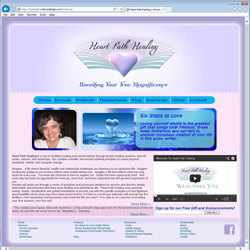 Project Scope: Heart Path Healing is a way to facilitate healing and transformation through private healing sessions, telecall series, classes, and workshops. We combine scientific and ancient spiritual principles to create physical, emotional, mental, and energetic change. Imagine…a life where financial, health and relationship challenges are doorways to an expansive life. Imagine trusting the guidance you receive without mind chatter taking over. Imagine a life that reflects what you truly desire in every way. You know the Universe is here to support you. Doubt has been replaced by trust. And every day becomes an opportunity for more joy, more love, and more expansion into the greatest expression of you. Design components: Design of new web site including reworking their logo, bringing more of the colors in the logo to the forefront and reworking the shape of the heart and the wings. The site was developed in phases and Phase II is the development of an ordering system where their clients can purchase classes and retrieve recordings of those classes as they wish.